Meredith Porte has been a producer and host at WLRN Public Television for over 25 years. She currently produces and hosts the arts and entertainment program entitled ArtStreet where she's had the opportunity to interview several interesting guests including Avner Zabari. Avner Zabari's appearance on 'Control' (Spanish). 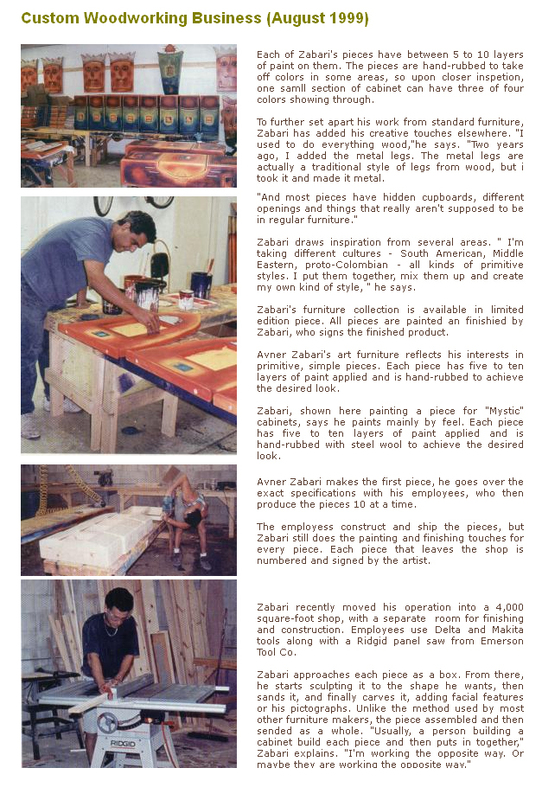 Avner showcased his unique process of designing his signature furniture. "CITY OF INSPIRATION. 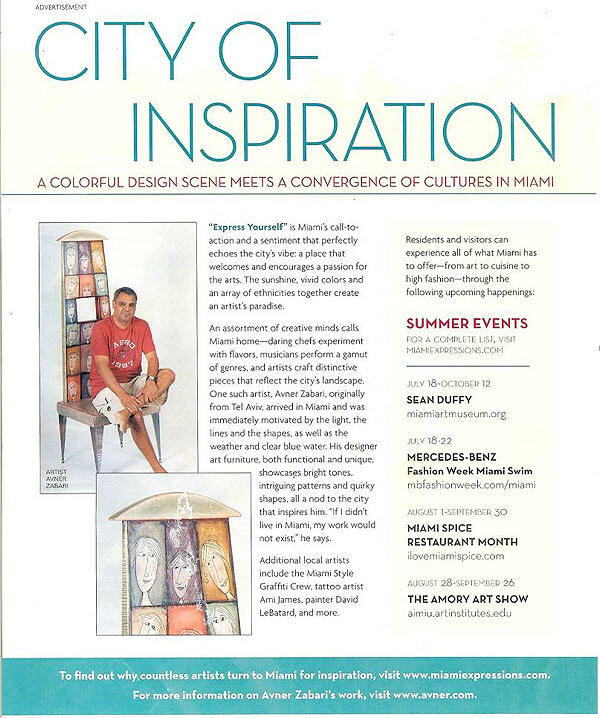 A colorful design scene meets a convergence of cultures in Miami." "Express Yourself" is Miami's call-to-action and a sentiment that perfectly echoes the city's vibe: a place that welcomes and encourages a passion for the arts. The sunshine, vivid colors and an array of ethnic cities together create and artist's paradise. 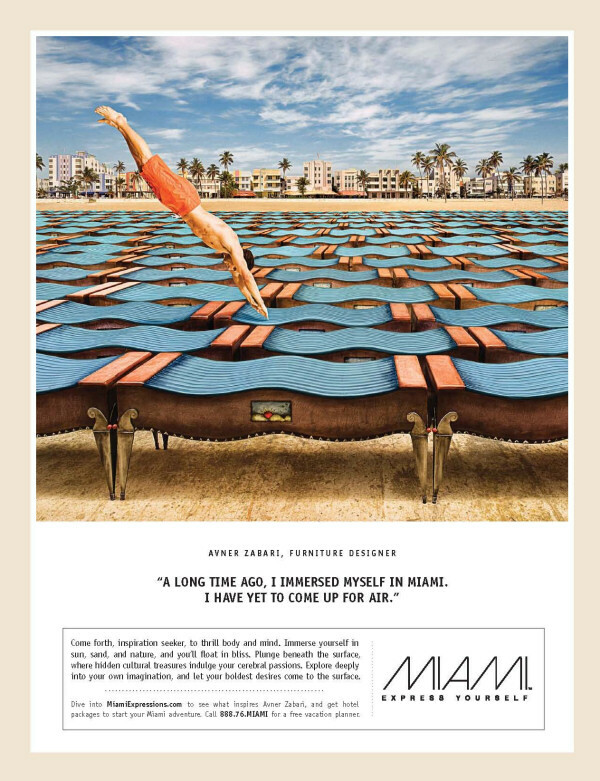 "A LONG TIME AGO, I IMMERSED MYSELF IN MIAMI. I HAVE YET TO COME UP FOR AIR." Come forth, inspiration seeker, to thrill body and mind. Immerse yourself in sun, sand, and nature, and you'll float in bliss. Plunge beneath the surface, where hidden cultural treasures indulge your cerebral passions. Explore deeply into your own imagination, and let your boldest desires come to the surface. 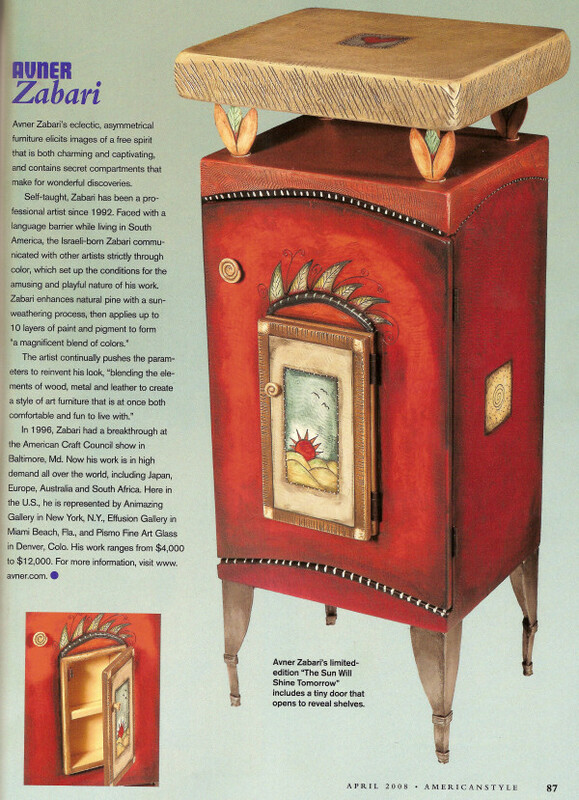 Avner Zabari's eclectic, asymmetrical furniture elicits images of a free spirit that is both charming and captivating, and contains secret compartments that make for wonderful discoveries. The Artist continually pushes the parameters to reinvent his look, blending the elements of wood, metal and leather to create a style of art furniture that is at once both comfortable and fun to live with. Avner Zabari's Furniture creations put a smile on your face. 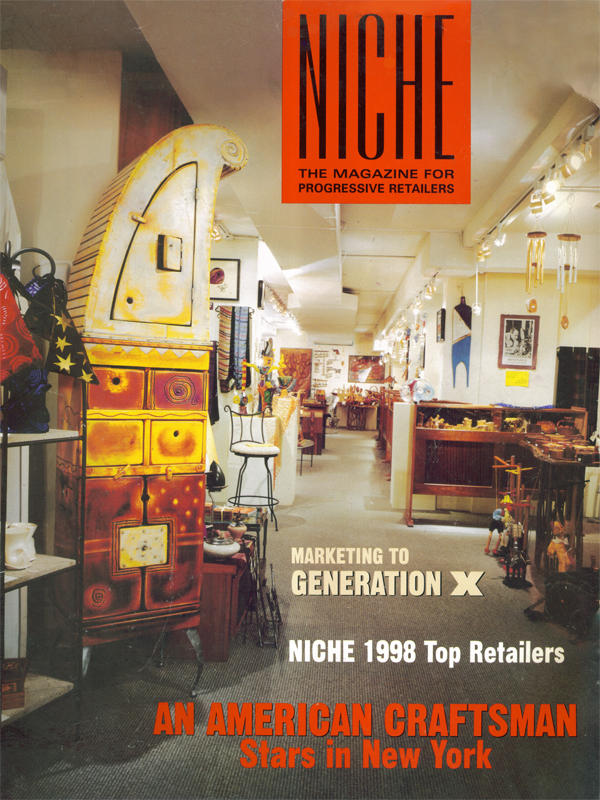 In Fact, the quirky consoles, tables, cabinets, and other pieces are fun to look at and live with. Avner Zabari's artwork dazzles the eyes with its bright colors, promitive-looking faces and mysterious pictographs. It can also be sat upon or store clothes or wine. The line of furniture that Zabari has created is as funtional as it is eyes-catching. 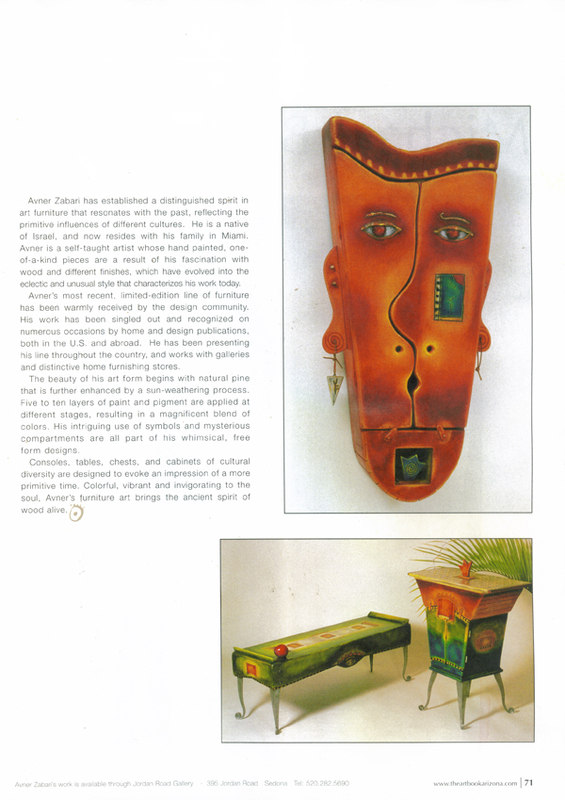 His cabinets, benches, wall-hangings and chests all reflect his interestin ancient cultures. Sitting Cross-Legged in a leather chair behind a desk of his own design in his Miami Studio, Avner Zabari, 40, wears a white T-shirt, relaxed jeans and a look of contentment. Not so long ago, the self-taught artist toiled in his garage to crated his own brand of art. He's since gained success with his whimsical and funtional furniture collections comprised of consoles, chests, tables and chairs. These works are now represented in over 75 galleries throughout the US and Europe.